This is a guest post from Scot Wingo, the CEO of ChannelAdvisor . ChannelAdvisor offers Software-as-a-Service (SaaS) solutions for managing ecommerce channels. This year ChannelAdvisor will process over $3b in transactions across search, CSEs, and marketplaces for over 3,000 online retailers. 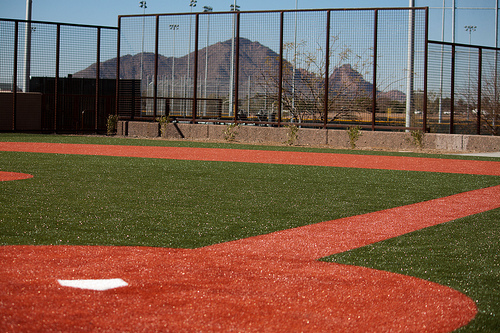 One common pitfall that many online retailers make is the ‘field of dreams’ problem. They put their entire budget and efforts into building a great site but then have little-to-no plan for how to drive traffic to that site. Many retailers put too much focus on one source of traffic like search engine optimization (SEO). While this source of traffic is great because it's high quality and free, there are other channels that ecommerce websites should take advantage of for effective multi-channel ecommerce. 1. Direct Traffic – Direct traffic channels include email marketing , affiliate marketing, and direct URL navigation/bookmarking. 2. Paid Search – Paid search means buying traffic from search engines (e.g. Google and Bing) on a pay-per-click (PPC) basis. Search engines can drive traffic to your site for further conversion, and paid search requires you to master the creation and management of keywords, keyword-level building, conversion rates, etc. 3. Comparison Shopping Engines (CSEs) – There are over 100 comparison shopping engines with a variety of different business models from free (Google Product Search and TheFind.com) to pay-per-click (Shopping.com, Shopzilla, Nextag, etc.). CSEs can also drive traffic to your site (usually item pages) for further conversion. 4. Marketplaces – Marketplaces are sites that allow you to offer your items for sale. The consumer purchases them from the marketplace, not your site. eBay is the largest marketplace, followed by Amazon. Amazon’s success in marketplaces has led to an explosion of new marketplaces like Sears, Walmart, Newegg, and Buy.com . 5. Mobile – The use of smartphones with sophisticated web browsers and barcode-scanning applications has increased their usage in online shopping. While still small, it’s an area retailers need to be tracking carefully, and we strongly recommend building capabilities in this area. 6. Social – With over 750 million active users on Facebook and 200 million Twitter users, online consumers are spending a bulk of their online activities engaged in social media . As Facebook and Twitter mature, they are also looking at social commerce. 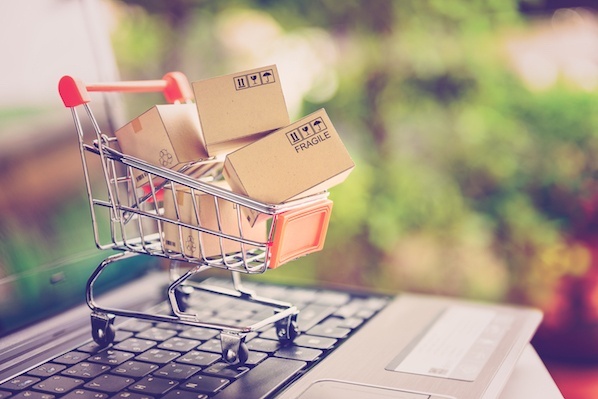 Some online retailers are already seeing significant primary and secondary sales from these channels, and we recommend retailers start experimenting there now. 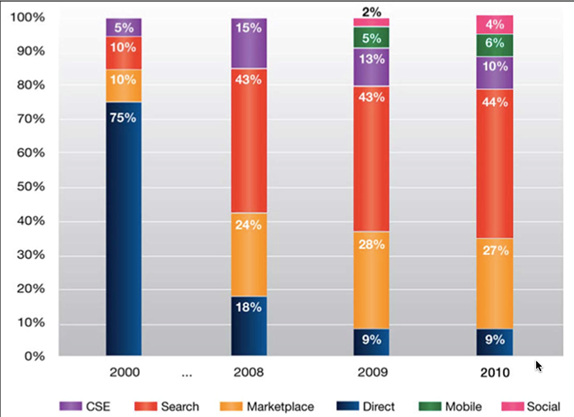 As you can see from the chart, consumers have changed their shopping behavior from a majority being direct (75% in 2001) to the majority driven by ecommerce channels (direct is only 9% in 2010) such as search, marketplaces, CSE, etc. This chart represents ecommerce businesses overall. Every retailer will have a different mix and number of channels. For example, maybe your ecommerce business is made up of 100% direct. However, if that is the case, you are currently missing out on 91% of the other ecommerce activity happening through other channels, and there are several risky implications for that. The ecommerce channel chart above will hopefully serve as a wake-up call to those businesses not taking advantage of multiple channels. Here are some of the top lessons retailers have learned from this. 1. There's no such thing as a free ride. If you rely on free/direct sources of traffic, you are fighting share losses. Direct has gone from 75% to 9% over the last ten years, while ecommerce has been growing 15-25%. Don't put all your focus just on SEO strategies when other channels are proving important as well. 2. Diversify . Furthermore, many other small online retailers we talk to put too much concentration on one channel, whether it'd eBay, Amazon, Google paid-search, SEO, etc. 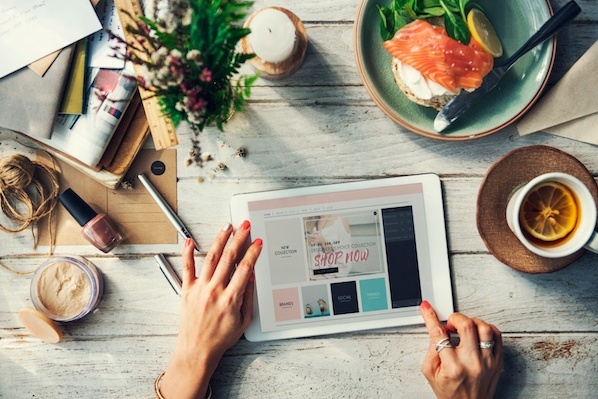 Even though they all offer strong ecommerce channels that can work, a concentration in any one channel adds risk to your business and means you are missing out on other important pieces of the overall ecommerce pie. 3. Build a portfolio of ecommerce channels. Most successful larger online businesses use portfolio theory (just like you have in the world of investing) to minimize risk to their business and maximize sales. When you use this approach, you have some ecommerce channels that are high margin, some that are lower margin, some that drive customer acquisition, and others that are more about retention. Finally, some channels are best for one set of products and other channels may favor others. Advanced retailers source against the channel product bias to help them continue to grow. 4. Put your products everywhere. Ecommerce is a zero sum game. This means each consumer is only going to buy from one retailer out of thousands, and that one retailer will win that specific consumer's order. If you don’t have the widest possible distribution of your products, you'll lose opportunities and another online retailer will gain opportunities. Here's an example. Sally tends to start her shopping via Google, Joe uses Shopping.com, Bill uses eBay, and Lucy prefers Amazon. If you are not utilizing all of those channels, you will not be able to sell to Sally, Joe, Bill, or Lucy. The timing and order that online businesses leverage these ecommerce channels is a common theme we have seen over the years. Many businesses ‘bootstrap’ using marketplaces like eBay and Amazon. They use the experience from those channels to expand to a site, and then utilize search and CSE. What is the goal for your online business? What are some of the channel and infrastructure investments you should make today to achieve your goals in the future?